This is my fourth year covering Folkemødet, Denmark’s political Roskilde Festival, and the editor of this fine publication always allows me a closing bit where I breach the journalistic wall and give a more personal view. The stats on this year’s Folkemødet are still pouring in and will continue to roll in for days to come. It’s official: over 100,000 were in attendance. And believe me, most of them increase their drinking up to tenfold while attending, and half of that is done on some state, municipal or businesses tab. Via taxes and fees, 22 million kroner found its way into the state coffers and 16 million kroner into Bornholm’s – roughly a 5 million kroner increase in both totals on last year. The raw numbers are impressive, but cannot convey what the crush of people feels like in the tiny harbour village of Allinge. Bornholm itself has about 40,000 permanent residents. Folkemødet comfortably more than doubles that, and they are not spread across the entire island, but crammed into a few square kilometres against the sea. I spent my four days there in a room at Allinge Røgeri. On Saturday, that restaurant served up over 800 fish buffets during the lunch rush alone. With tents everywhere, the smell of food frying in the air and loud music and even louder hawkers trying to lure the faithful into whatever they have going on at that moment, the whole thing feels like a county fair gone to the political dogs. This year’s meeting had the extra added attraction of an increased police presence and security working its way through the throng thanks to the presence of noted anti-Islamist Geert Wilders and a group of ultra-nationalists. The crowds, the music, the politics, the noise and the general confusion can finally overwhelm even the heartiest political junky. My personal breaking point came on Friday. I make no secret of my soft spot for Bornholm; it is the first place I lived when I moved to Denmark and I was there for the best part of my first five years. My editor often has to point out that he can’t give me the front page simply because a ceramic artist in Gudhjem just took a new set of pots out of the kiln. I hate to see the visiting masses drop their plastic beer cups and other trash in the streets. Friday is the day that the heads of the major political parties hit the main stage. The crowd for Helle Thorning-Schmidt’s speech swelled to 8,000. I have to admit that I wasn’t actually part of it. I did see her on the big screen as I walked by though, and she looked as stately and serious as ever. I listened a bit to the live feed as I took a long hike to Hammershus to get a break from the mayhem. 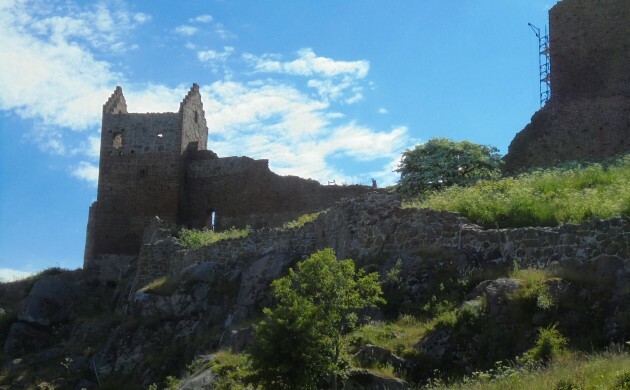 Hammershus is the ruin of an ancient castle. It is one of the oldest and perhaps one of the largest castle ruins in Europe. I am speculating here, because although Bornholmers will tell you it is the largest and oldest, as soon as I write that, some Scottish guy will write to tell me what an idiot I am and fill up my email box with very large pictures to prove the same. I was scheduled to cover the Wilders debate the next day, and I think I wanted a little peace just in case the worst-case scenario occurred and someone tried to blow up the school house – with me inside – where he was appearing. So, I walked, half listened to speeches on my iPhone and reflected on what Bertil Haarder’s ‘People’s Meeting’ had grown into. In her opening speech, Winni Grosbøll, the mayor of Bornholm, reflected that many thought that last year’s version with its 60,000 attendees was too large. I wonder what those pundits are saying now that the century has been toppled. Apparently tree advocates take a break during Folkemødet. And Folkemødet isn’t cheap. You have to pay to get there, pay to be there, pay to stay there … does a real ‘grassroots’ organisation really have the cake to be part of it all? I eventually found my mojo, went back down the hill and got back to work. I covered Wilders and lived to write about it. Has a Folkemødet ever been better timed or more incendiary?